Costa Calma is a large bay of approx. 1.5 km length. Southwards you can walk along the beach to Morro Jable for approx. 21 km. In the north the beach is limited by black rocks extending into the sea. Hotels and apartments are situated directly behind the beach and are not separated by a road or promenade. 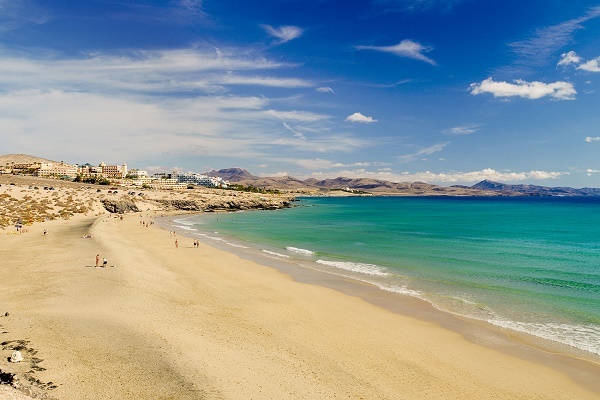 Costa Calma beach is suitable for children since there are hardly any high waves. You can also do naturism. How to get to the beach: Take the FV 2 towards Costa Calma. In town, drive onto the road which goes parallel to the FV 2 (seaside), here you can park at the roadside. Now just walk through the hotel grounds and you are on Costa Calma beach. Parking options: At the roadside of the road parallel to the FV 2. Or: at the end of some side roads there are smaller car parks where you can also park.